Dr. Gant-Britton: After Black History Month was developed, emphasis was still on a few key figures such as Harriet Tubman and Frederick Douglass and people who had done many things to try to bring African Americans into the national consciousness. Since then those figures, as well as key figures from the civil rights movement like Dr. Martin Luther King, Malcolm X and others, continue to be a prime focus. But beyond that we have had the opportunity to do so much more research on the many other aspects of the relationship of African-Americans to the United States and Africa. If you go around the country you can find all kinds of wonderful things happening during Black History Month that really include contemporary achievements, research back to ancient Africa and so many other aspects. Bill Radke: Tell us about some of that newer research that interests you. For example way back in the 12th century the University of Timbuktu, which still exists, and the Mosque at Sankore had 25,000 students. Again this is in the 12th century. So, sometimes this idea that "academics are white" seems to prevail in some schools, but when students find out that we too can claim this amazing heritage of learning, I think it's really motivating. 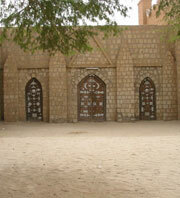 How do the students react when they learn about a university in Timbuktu? Oh! They're totally skeptical! They say, "Dr. Britton, you're kidding! 25,000 students in the 12th century, you've gotta be kidding!" They don't believe me! Because it's not in the standard history books. And this is so true for many students around the country, which is one of the reasons why a lot of people say that African-American history and Black History Month is not just for African Americans; everybody needs to know this. How did you react to Black History Month when you studied that curriculum in school? When I first encountered it, I was like many students. I was embarrassed. I felt ashamed to have a history book that only had pictures of African Americans that were slaves. They looked poor; they looked downtrodden; they looked miserable. This wasn't something that was very motivating to me. So, to participate in Black History Month and find out about contributions of amazing people made me feel amazing. It made me feel like I could do amazing things and that's what I try and convey to my students. For how long doctor, should America have a Black History Month? As long as we don't have complete inclusion in our so-called standard U.S. history classes. So, taking that extra time to make sure that students from all backgrounds get a rudimentary knowledge is really important. For example in our elections today we have the opportunity for an African-American candidate to be taken seriously, in part, because Black History Month has been around as long as it has. Why do you think there is such a sense of surprise at the success of Barack Obama's candidacy? Africans who excel are considered to be the exception: they're special, they're the stars. And so there is a way in which they are categorized differently from the rest of the population. So, this is great from the standpoint of acknowledging Barack Obama as an individual, but it's unfortunate as far as historians are concerned if we take it in a context of which this exceptionalism seems to place the majority of African-Americans in an inferior position. Dr. Britton, thank you so much for spending time with us. Three cheers for Dr. Gant-Britton, a woman who speaks out for the truth concerning the history of African influence in higher education. Our community needs this voice in the mix when so many of our youth are underrepresented in universities and colleges across America.